Ivins is a city in Washington County, Utah, United States and is a part of the St. George Metropolitan Area as a suburb or "bedroom" community. The population was 6,753 at the 2010 census, and it was estimated at 6,930 in 2011. Although Ivins was listed as a town in the 2000 census, it became a city in 1998. Prior to the arrival of Mormon settlers, this area was inhabited for thousands of years by the Paiute people and their ancestors. The Shivwits Band of Paiutes reservation is located immediately west of Ivins City. Ivins was born out of the fulfilled dream of several men to bring water to the Santa Clara bench. This was not easy to accomplish. An eight-mile canal had to be built from the Santa Clara creek near the Shem smelter to the bench. This was not an easy undertaking, the route took them over steep mountain sides and deep ravines that needed to be siphoned or plumed. Work began in 1911 and the canal was completed in 1914. Ivins Reservoir was built to store the water in 1918. Civil engineers, Leo A. Snow and Clarence S. Jarvis first conceived the idea in 1909. When residents decided they wanted a different name for their town than "Santa Clara Bench," they chose "Ivins" after the Mormon Apostle Anthony W. Ivins. He was asked and didn't object as long as they spelled it right. He then donated $100 toward a chapel and later sent a bell for it. 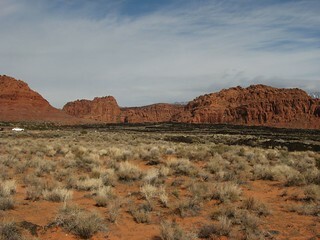 Ivins is near Tuacahn (an outdoor arts and amphitheater) and Snow Canyon State Park which draw many people to the area. There are many new planned developments (some with golf courses) near or in Ivins, joining the earlier Kayenta and Padre Canyon developments. Ivins is home to the Kayenta Desert Community which includes the Coyote Gulch Art Village. It also has a labyrinth made from small stones called the Desert Rose. There are petroglyphs from the Anasazi tribe along the banks of the Santa Clara Creek northwest of Ivins. The Red Mountain Resort and The Biggest Loser Resort are two spas located in Ivins.